Do you want to copy DVD to DVD? Don't waste your time on difficult software. Free DVD Copy software will easily do the job for you. The tool will create a complete copy of your original DVD with chapters, trailers and bonus videos. Free DVD Copy tool supports DVDs from all the regions and creates a region-free copy of it. Free DVD Copy can also create a digital copy of your DVD that you can watch on TV, smartphone, tablet or any other video device. Download Free DVD Copy software on your PC. The supported operating systems are Windows 10, Windows 8, 8.1, 7, and Vista. You can select between an online version of the installation file and the offline one. The 1st requires a fast and stable Internet connection. While the 2nd one can be later installed on a desktop or laptop not connected to the Web. As soon as you downloaded the installation file of Free DVD Copy program, double-click to run it. Since the freeware doesn't contain any toolbars or ads, you can click the "Next" button all the time for a full installation. The Free DVD Copy will automatically start after the installation. Prepare the DVD that you want to copy. Make sure the disk is not corrupted or protected. Free DVD Copy software doesn't copy protected DVDs. Try to play the DVD on a PC or a DVD player to make sure it works fine. In Free DVD Copy software, click the "+DVD" button and select a VIDEO_TS folder on your DVD. The tool will ask what files you want to add. Select the longest ones or all of them if you want to copy the DVD completely. If you have a DVD folder on your PC, follow the same procedure. Alternatively, you may drag-n-drop the VIDEO_TS folder into the software. If you want to copy DVD to DVD with all the content, select "to DVD" option and prepare a new blank DVD. It's recommended to use DVD-RW. In case you need to make a digital copy on your computer or an external hard drive, select an output format for your DVD. The format choice depends on your goals whether you want to watch the movie on a TV, portable gadget or just have a copy of it to be on the safe side. To make a copy of the DVD to DVD, click the "Burn" button. As soon as the software copies the video, it will ask you to insert a blank DVD to write the copy onto a disk. To save DVD to PC, click the chosen format and then click the "Convert" button. Wait till the conversion process is over and check the folder with a new file. Now you can move it to a phone, tablet or external hard drive. How to copy a DVD on Windows 10? Free DVD Copy software perfectly runs on Windows 10. To copy the DVD on a PC with Windows 10, you need to follow the steps from the guide above. Install the program on a Windows 10 based computer. Insert the DVD with the video that you want to copy. Select an output format and run the copying process. As soon as the new disk is ready, insert into your DVD player to check if everything is fine. How to copy a DVD to a flash card? Sometimes you might want to copy DVD to a flash drive to watch it on your smart TV. In this case, you should check what format is supported by your smart TV. Check the exact settings (extension, codec, bitrate, etc). 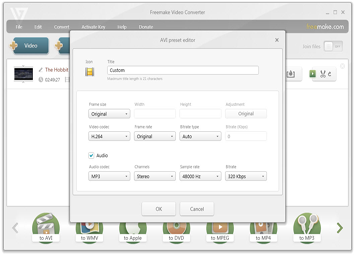 Then add your DVD into Free DVD Copy software and select the output format. Click on the drop-down menu with a quality choice and select to create a custom preset. Choose the necessary parameters for your DVD copy and click "OK". Then run the conversion process. When the software creates a copy of your DVD, connect your flash drive to your PC and transfer the new movie onto it. How to copy DVD to another DVD? When you need to copy DVD to another DVD, you might need to copy a movie with all the additional data such as trailers, comments, episodes, and so on. To do it, add a complete VIDEO_TS folder from your original DVD into Free DVD Copy tool and select "to DVD" as an output option. Prepare the blank DVD and be ready to insert it when the software copies the original content.